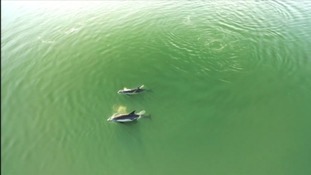 This jaw dropping footage of dolphins swimming has been captured by a drone flying over the Plymouth sound. Spotted by Lewis Huddy, of Heads Up Definition, he followed the group explore inland from the English Channel yesterday morning (21st January). I first saw them under Laira bridge in Plymstock and they worked their way down the river and out past Mount Batten. The video ends where I last saw them heading south in Plymouth Sound.